46 Landscape Architect and Specifier News retreat for the Morgan family and friends. Complicating matters a bit more was the fact Esarey's clients kept adding to the scope of the project, including outdoor entertaining, cooking, eating and entertaining spaces for large groups of people. 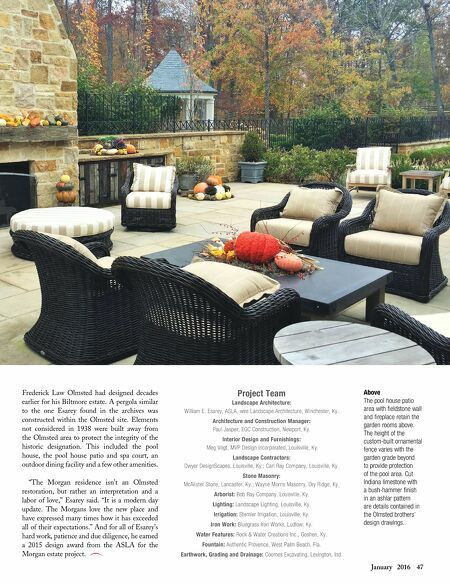 "As new program details arose, research of other Olmsted projects was completed and details borrowed," Esarey said, including that of a pergola Top, Left The spa court features a seat-high, natural stonewall for ease of entry, and the curved top is for privacy. 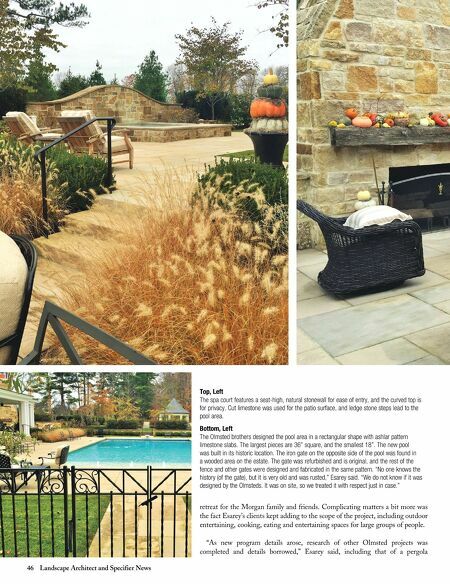 Cut limestone was used for the patio surface, and ledge stone steps lead to the pool area. Bottom, Left The Olmsted brothers designed the pool area in a rectangular shape with ashlar pattern limestone slabs. The largest pieces are 36" square, and the smallest 18". The new pool was built in its historic location. The iron gate on the opposite side of the pool was found in a wooded area on the estate. The gate was refurbished and is original, and the rest of the fence and other gates were designed and fabricated in the same pattern. "No one knows the history (of the gate), but it is very old and was rusted," Esarey said. "We do not know if it was designed by the Olmsteds. It was on site, so we treated it with respect just in case."